Like to entertain guests in the backyard? Wish you had the perfect place to grill? 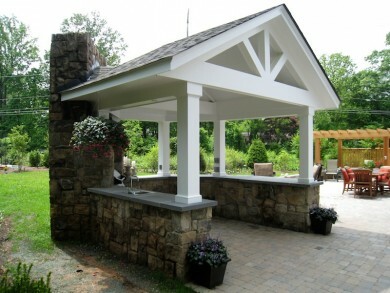 Complete your landscape design with an outdoor kitchen custom-built to meet all your needs and more! At O’Grady’s Landscape, we can help you create lively outdoor living areas with space for cooking, dining, chatting with friends and family, and even parties for the whole neighborhood. From simple grilling stations to lavish cooking stations with all the essentials for a backyard party and anywhere in between, we can help. Build memories to last a lifetime with an outdoor kitchen by O’Grady’s Landscape—call us at 703-533-5001 to schedule a consultation in Northern Virginia! Whether you want a modern, stylish outdoor space or a functional cooking area for the family chef, we have the accessories and materials to make your vision a reality. Bring the convenience of indoor cooking outdoors with full-sized cooking surfaces or create the perfect place to host summertime crab feasts and outdoor parties with wine coolers and bar seating. When it comes to outdoor kitchen designs by O’Grady’s Landscape, the options are endless! There’s nothing like summer nights spent by the crackling fireplace, the savory aroma of your favorite grilled dishes filling your backyard as you enjoy the warm weather and the views of your colorful gardens. Give yourself something to look forward to each winter—let us help you build the perfect outdoor kitchen so you can enjoy all this and more with family and friends. And don’t forget to ask us about landscape lighting so you can enjoy the new space day or night. Call us at 703-533-5001 to schedule a design consultation in Northern Virginia and make the most of each warm day with the landscape design of your dreams!